FUCHS PETROLUB SE achieved a “B”-Rating, based on the holistic sustainability assessment from the independent sustainability provider “Sustainability Intelligence” on a nine-step scale of “A+” to “E”. FUCHS demonstrates in this way an above average sustainability performance compared to its peer group and outperforms the average rating of the MDAX (“C+”). The German Sustainability Award, which FUCHS received in 2016 as first chemical company, is a national prize honoring businesses, municipalities, and research institutes for outstanding achievements in sustainability. The schedule for the event, taking place annually in Düsseldorf, is associated with the German Sustainability Conference and includes forums for dialog about current challenges. In early December 2018 FUCHS was represented at the conference and took the podium for a discussion on “Next Generation Chemicals - An Industry Reinvents Itself”, together with three other chemical companies, including Evonik. The session was hosted by the consultancy A.T. Kearney. Like few other industry sectors, the chemical industry is facing disruptive changes, also driven by the challenges of sustainability. The industry is preparing for these changes and in doing so overcomes borders in multiple ways: new cooperation models promise more competitiveness and more sustainability. Different players join forces: corporations with start-ups, suppliers with suppliers and even competitors amongst each other. The discussion tackled questions, challenges and obstacles to next generation sustainable chemistry and highlighted the changes of supplier-customer relationships in the chemicals industry regarding digitalization, decentralized energy retraction and increasing decarbonization requirements. “Responsible practices, strategic sustainability and business success go hand in hand for FUCHS”, Gosalia told during the podium discussion. “Sustainability can become an important driver of growth for the industry and open up new, attractive business opportunities for us, while strengthening relationships with our suppliers and customers at the same time”, Gosalia said. As part of its social responsibility as a corporate citizen, FUCHS supports social and voluntary commitment in a variety of ways at its worldwide corporate locations and especially at the Group headquarters. This also includes cooperation and involvement in series of events organised by the Chambers of Industry and Commerce (IHK) with a focus on strengthening sustainability in the Rhine-Neckar metropolitan region, like for example the IHK's CSR breakfast series, at which various companies meet several times a year to exchange ideas and present their sustainability concepts to one another. In 2015, FUCHS also hosted the IHK CSR breakfast at its Mannheim location. The last CSR breakfast took place on November 7, 2018, at the headquarters of Südzucker AG. On October 18, 2017, our location in Mannheim has been awarded at the “Congress of Resource Efficiency and Circular Economy" (“Ressourceneffizienz- und Kreislaufwirtschaftskongress”) in Baden-Wuerttemberg for a remarkable energy and CO2 reduction measure. By means of this project (German title: “Energetische und stoffliche Verwendung von Abfall-Kondensat – ein Beitrag zur Nachhaltigkeit“) FUCHS managed to create an example of excellence for process-related sustainability and resource efficiency in Baden-Wuerttemberg. For the new test field building the attention was focused on its future sustainable operation, particularly on the energy balance. Through the utilization of high temperature condensate, which is a waste product of the neighboring production plant, for heating the new building and keeping an adjacent storage building frost free, about 18t CO2 can be saved annually. Its final use as feed water for the cooling tower and adiabatic air cooling reduces the need for demineralized water by 1.000 m³ per year. The initiative “100 Companies for Resource Efficiency” (“100 Betriebe für Ressourceneffizienz”) demonstrates how resource efficiency can be implemented in a concrete way and highlights the related value. Our company representatives proudly received the award in October 2017 from Franz Untersteller, Minister of the Environment for the state of Baden-Wuerttemberg. 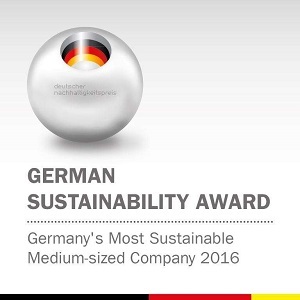 Out of more than 800 participating companies, FUCHS won the first place in its first application to achieve the German Sustainability Award in this year for the category “Germany’s most sustainable medium-sized company 2016.” The German Sustainability Award is the national prize, recognising outstanding achievements of sustainability in the economy, local communities and research and at the same time one of the most prestigious prizes of its kind in Europe. It is presented by the German Sustainability Award Foundation in cooperation with the German government, leading municipal associations, trade associations, civic organisations and scientific institutes. Annually since 2008, the award recognizes organisations, which combine economic success with social responsibility and environmental protection in an exemplary manner, use sustainable actions for further growth and thereby foster in a particular way the idea of a sustainable society. The award was presented in the context of a festive gala following the 9th German Sustainability Conference on November 25, 2016 in Düsseldorf with around 1,200 invited guests. The German Sustainability Award aims to promote sustainable development in Germany and to support the embedding of the principles of corporate social responsibility in public opinion in a better way. The award should demonstrate that sustainable action not only helps solving social and ecological problems on a global or local scale, but may also increase profitability and competitiveness. Awarding of the German Sustainability Award is based on an annual corporate competition. Eligible to participate are all companies, who produce and/or offer goods/services in Germany. Nominees and winners are selected in a multistage process by 12 experts from economy, politics, research and civil society. With the certification of the three largest sites in Europe according to Energy Efficiency Standard ISO 50001, the global implementation of maximum fleet CO2 emission thresholds and the completion of “Sustainability Meetings” at the twelve largest production sites, FUCHS once again made considerable progress towards a more sustainable company in 2015. Since 2011, FUCHS Sustainability Management has continuously implemented improvements in the dimensions Economy, Ecology and Social Affairs. 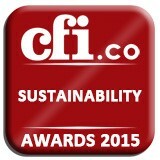 In January, the business magazine “Capital Finance International” (CFI) acknowledged these efforts with the “Sustainability Award 2015” for best company management compliant with environmental, social and governance criteria in Germany. The CFI.co judging panel feels that for setting an example on sustainability in the lubricants industry, Fuchs is most deserving of the 2015 Best ESG Leadership Germany Award.